Not absolute necessities, for sure, but a whole lot of fun. 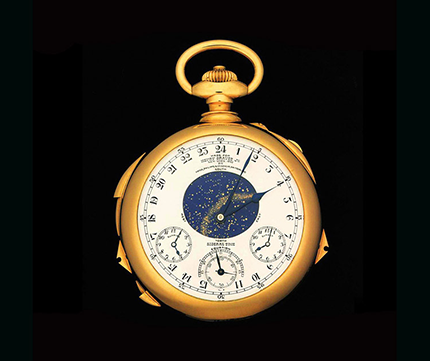 This pocket watch by Swiss watchmaker Patek Philippe is a genuine masterpiece. It was made in the 1920s from 500 grams of gold – for the same New York banker that gave it its name: The Henry Graves Supercomplication. Its creator worked on it for more than five years, fitting and assembling every one of the 920 individual parts by hand – including 430 screws, 110 wheels and 70 jewels. Besides displaying the time, the luxurious one-off has no fewer than 24 additional functions. It changed hands in 2014 for a stunning 17 million euros. At Paris auction house Artcurial, bidders battled for this iconic red sports car for a full 11 minutes before the 1957 FERRARI 335 S SPIDER found a new home and became the most expensive Ferrari of all time, selling for 32,075,200 euros. According to reports in the Spanish media, football stars Lionel Messi and Cristiano Ronaldo were among the bidders, but no details about the future of the twelve-cylinder automobile are known. Legend potential: high. 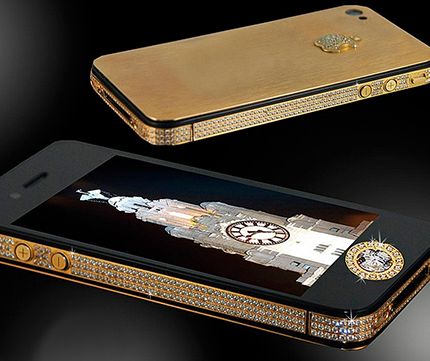 is easily the most expensive iPhone 5 in the world. Refined by Stuart Hughes, the showpiece costs almost 12 million euros, is encased in solid 24-carat gold and studded all round with 600 white diamonds. 52 little gems make up the glittering Apple logo on the back, while a single perfect 26-carat black diamond sparkles on the display as the home button. And a good everyday companion all round. 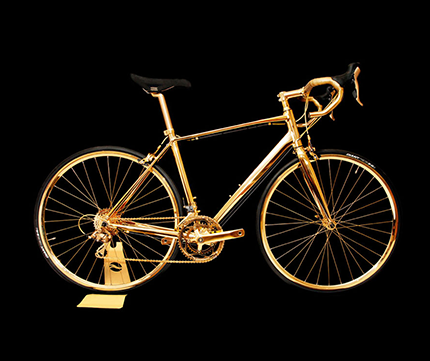 The gleaming Goldgenie racing bike is covered in 24-carat gold all over: the entire structure – frame, rims, chain, handlebars and cogs – is made from the precious metal. The bike is available from the website of British company Goldgenie, whose customers are said to include the Beckhams. This trimaran goes by the name of Adastra, which translates as “to the stars”. But it’s not supposed to be taken literally – it’s not a seaplane, after all. Even so: it goes like a rocket. The flamboyantly designed craft measures 42.4 metres long and 16 metres wide. Up to nine guests and six crew members can bask in admiration in the marina or set off for a jaunt in the 15-million-dollar boat: with its 1150 hp Caterpillar engine, it’s built to cope with the open sea.